According to regulations CE 110/2008, Whisky is a spirit drink produced by distillation of a mash made from malted cereals, which has been saccharified by the diastase of the malt contained therein or fermented by the action of yeast; by means of one or more distillations at less than 94,8 % vol., so that the distillate has an aroma and taste derived from the raw materials used; and aged for at least three years in wooden casks not exceeding 700 litres capacity. The minimum alcoholic strength by volume of whisky shall be 40 %. No addition of alcohol, diluted or not, is permitted, neither is to sweeten the product, nor to add any other additive than plain caramel used for colouring. The drink won popularity with the creation of the continuous operation Columns, because by using them a more refined and with a higher alcohol content beverage was achieved; currently is the most consumed spirit drink in the world. Nowadays whisky is produced in many parts of the globe, finding the most known producers Scotland, Ireland, Canada and the USA; although other areas have launched themselves to the whisky production, with good results. 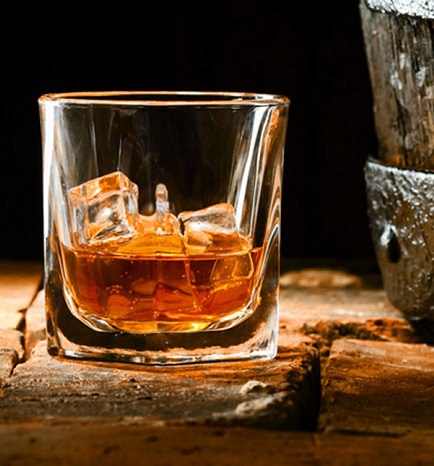 Whisky can also be classified, besides from its origin, according to the main ingredient used for its elaboration or to the production method followed. In Bulk Wine & Spirits we have a wide selection of bulk whisky varieties.